Hey y’all! Welcome to the 24th episode of The Fan-Damn-Tastic Marketing Show! In today’s episode I talk about Amanda Palmer leverages social media to create and cultivate fans, and also what your brand can learn from her efforts. I am mention a recent Forbes article where Amanda talked about some of the things she’s learned from using social media as a channel to connect with her fans. 10:00 – Insights from the Forbes interview with Amanda into what she’s learned from connecting with her fans via social media. Here is the link to the Forbes article that I reference in this episode. 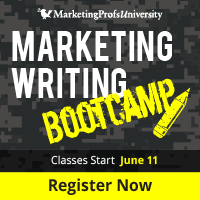 And here’s the link to learn more about MarketingProfs’ Marketing Writing Bootcamp. Make sure if you register for the Bootcamp to use the promo code FANDAMN to save $200 on the course! interesting 16:30. agreed with that your audience is your fans The haters are out there and they’re doing their thing, but they weren’t contributing to your Kickstarter anyway.